Gemologist and mathematician Marcel Tolkowsky lived to a ripe old age of 92, leaving behind a shining and enduring legacy in the diamond business. His family history is deeply rooted in diamond cutting; at least two members of his Belgian clan became celebrated diamond cutters. Gabi Tolkowsky, his nephew, invented the “flower cut” for diamonds and is currently a consultant for De Beers. A cousin, Lazare Kaplan, runs a successful diamond manufacturing and distribution business in New York City. As for Marcel, he is most famous for coming up with the mathematical formula that aims to achieve the most desirable brilliance in a diamond. The round brilliant diamond cut has become an industry standard and is widely considered to be the ideal cut in the business of gemstones. Marcel Tolowsky’s upbringing in the diamond cutting trade coupled with his educational background paved the way for this benchmark formula, one which he presented in 1919 as his PhD thesis. 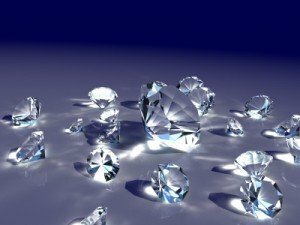 The gist of it is that, in order to maximize reflected light, and consequently, its brilliance, a diamond has to be cut in 58 facets. This specification, plus other details of his round brilliant cut diamond ideal, is known in the gemology business as either the “American Ideal Cut” or “the Tolkowsky Brilliant”. A brilliant or a cut diamond is arguably at its most beautiful and desirable when light is maximized and reflected by way of expertly-done facets. Many diamond ads worked around this ideal, often exaggerating the way a gorgeously-cut gemstone dazzles the eyes and all but shouts how precious and priceless it is. Tolkowsky’s formula helpfully explains how to achieve this appearance and desired result by explaining both diamond proportions and how facets work. However, gemologists and diamond cutters chose to modify this model depending on the type of diamonds they worked with, and other circumstances affecting the process of diamond cutting. A diagram of the American Ideal Cut illustrates how the 58 facets are distributed on a round brilliant cut diamond: 33 are on the crown or the thick part above the stone’s girdle, and 25 are on the pavilion, which is the conical base of a diamond. While this model is originally meant to guide diamond cutters, there have been different interpretations and adjustments to the round brilliant diamond cut through the years. Marcel Tolowsky migrated to the United States in 1940, bringing with him his passion and ideas for diamond design. He was heavily involved in the diamond business as a designer and dealer up until 1975 when he opted to retire. Some of the more prestigious groups that benefited from his expertise and vision include the Diamond Trading and Precious Stones Association where he was a long-time member, and the Diamond Dealers Club of America, where Marcel Tolowsky served as one-time chairman within his nearly fifty-year membership. He died of heart failure in February 1991 in a hospital in Manhattan. His book Diamond Design remains a favorite and trusty reference and guideline among today’s diamond cutters.